Hurrah for the new American League! Their dangerous, and never do they suffer from fatigue. Except for that one time in Paris. When they got into a scrap with Anna Faris. Attempting to save the loyalist, Moira McTague. Yeah! She was sitting next to the very polished creative team of Writer: Geoff Johns; Artist: David Finch; and Publisher: DC Comics in March 2013. Using GENERAL terms, answer the following 4 questions about this first part of a STORY entitled 'World's Most Dangerous'. WHAT'S THE MAIN THRUST OF THIS TALE: Guided by the A.R.G.U.S. 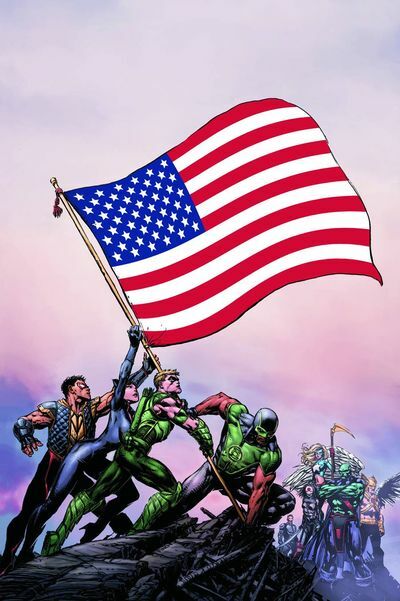 representative, Amanda Waller, Colonel Steve Trevor is persuaded to recruit Hawkman, Katana, Vibe, Stargirl, Martian Manhunter, Green Lantern, and Green Arrow, to form a new American based Justice League. ARE THE MAIN OBJECTIVES ACHIEVED: No. Not yet. Martian Manhunter has to have his say first. Plus Catwoman has to be added to the roster too. ANYTHING ELSE HAPPEN: For as of yet unexplained reasons, a shrouded figure is attacked by the main branch of the Justice League. HOW DOES THIS STORY END: With the revelation that Green Arrow is the shrouded figure in question, and he's dying from his injuries in a hospital bed. As much as I did enjoy reading the numerous characters taking the p*ss out of Steve's past 'relationship' with Wonder Woman, one of stand-out pieces of dialogue for me in this issue, was when Stargirl said the name -- 'Pemberton'. As in Sylvester Pemberton. Also known as the ex 'JSA' member, Star Spangled Kid. Ohhh! This is looking good. (+) Now I did like the idea that the Justice League of America have been formed with the intention of counteracting the current Justice League. I suppose you could safely say that this is a prominent cross-over event in the works. Right? (+) Isn't T.O. Morrow a great surprise? Plus I can't wait to see more of him and his mysterious new ally in the future. (+) This new team looks like a smashing new team in my eyes. I just hope that the roster doesn't ping-pong as others have in the past. (+) Just like his artwork on 'The Dark Knight', David Finch's ware's in this issue is just breathtaking to follow. Keep it up, pal. I'm sure you've got a lot more in store for us. (-) Even though I understood perfectly well that a lot of stuff had to be explained in this first instalment, overall, I still felt that it was a mite too top heavy in the exposition department. Personally speaking, I felt that it bogged the whole thing down in lengthy rhetoric and back-story. (-) Do we comic book fans honestly believe that DC will kill off Green Arrow next issue? Especially when he has his own show in syndication! Ha! Not likely, huh? JAMES TIEN AS COLONEL STEVE TREVOR: Did you know that James and Steve could have had very different careers path if their roles in life weren't overshadowed by somebody else's? James': by Bruce Lee. And Steve's: by Wonder Woman. Now that not a comparison you see everyday, is it? 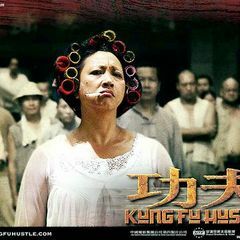 QIU YUEN AS AMANDA WALLER: If you've watched Steven Chow's 'Kung-Fu Hustle', then I'm sure you damn well know where I'm going with this. Both of these women are forthright, brash, and straight to the point. Nuff said. 'SMOKE AND MIRRORS' BY PALOMA: In a similar vein to Paloma's adorable song, I did find the genesis within this tale very lively, bubbly, and intriguing the more I thought about it. Overall I thought that this was a very good start for this new ongoing series. Not only did it captivate me with its dynamic and bold art. But it also intrigued me just enough to want to know what it will have in store for us in the future. Will T.O. Morrow create the Red Tornado and pit him against the JLA? Will the new team get along together? How will the Justice League react when they hear that the Martian Manhunter is a member of this new squad? Also, what's all that business with Darkseids daughter? Plus how will the Suicide Squad fit into this book? GIVE IT, IT'S DUES: A Great New Start to a Great New Series. Let's All Keep Our Fingers Crossed That The Build-Up Really Pays Off.